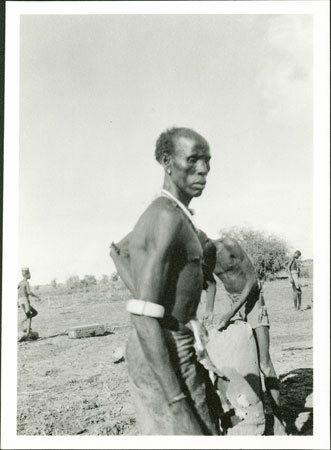 A man wearing an ivory arm ornament and bead neck ornament at Ugak village. Expedition carriers with baggage can be seen beyond. Since Evans-Pritchard notes that he returned along the Oboth, this image was likely taken in May 1935. Notes on print/mount - "05 5 248 Ugak"
Morton, Chris. "Portrait of an Anuak man" Southern Sudan Project (in development). 03 Jan. 2006. Pitt Rivers Museum. <http://southernsudan.prm.ox.ac.uk/details/1998.342.114.2/>.